Click on the four arrows bottom right for full screen view. This video is available in HD. Click on “HD” to choose the quality level you want to stream. [You can also view Choosing An Axe For Winter Camping And Travel on YouTube]. In the Northern Forest, an axe is your most important cutting tool. There is a general trend amongst outdoors people to carry quite small axes. These small axes are very wieldy, yet you can apply to them to large jobs such as felling trees as well as quite fine jobs such as carving useful implements and splitting quite fine firewood. They’ve got a half-length handle and a relatively light head. The handle only comes half the way from your fingers to your breastbone. That makes them eminently portable. They’re easy to put into a rucksack, even a day-sack they’ll fit into quite nicely. However, in the Northern Forest, it’s my view, that a larger axe than this has specific advantages. In winter, you need plenty of fuel, whether you’re bivvying out or sleeping in a heated tent with a stove, you need plenty of fuel. Obtaining firewood in the Northern Forest typically means felling dead standing trees and then, of course, you have to process them. You have to take the limbs off, you need to section the trunks and you need to split the wood into manageable sections that you can put into your stove. The trees here grow more slowly than further south. The growing season is shorter. At a more northerly latitude, the summers are shorter, the trees have fewer days in which to grow. This makes the rings of the tree closer together, which makes the wood tougher. In turn this means you need more cutting power from you axe than you do further south. In my opinion, a three-quarter length axe gives the extra cutting power you need for winter travel and winter camping in this environment. The additional handle length provides extra leverage. Also, it’s got a heavier head and a slightly larger cutting edge than the smaller axe. That gives it extra weight and extra cutting power as well. So, all of those things combined deliver more efficiency when you’re using this axe. As I’ve already said, the wood here is tougher, it’s tighter grained, it’s more knotty, it’s harder to cut, it takes more effort with a small axe. So a large axe like this gives you an advantage in processing the firewood that you need, particularly in winter. In terms of felling, this is an excellent axe. It’s also very good, very well suited to limbing and sectioning the trunk once you’ve brought it down. The extra length and extra weight of the head also means it’s very efficient in splitting firewood – yet you can still do the finer day-to-day jobs that you need to do, such as splitting down firewood to get your stove going. Despite its extra weight and size, a three-quarter length axe is still very portable, particularly if you think about the means by which you’re going to be travelling in a winter environment. You’re unlikely to be light-weight hiking. You’re much more likely to be travelling by snow-shoe with a toboggan or pulk, or maybe be skies with a pulk, or by snow-machine or by dog-sled. Taking an axe like this is not much of a problem when you’re travelling by those means. The benefits of carrying a tool such as this for winter travelling and winter camping far outweigh the downside of its extra size and extra weight. The video and text above should give you an idea of the power and versatility of the three-quarter length axe. I hope that it also demonstrates why this tool is my number one choice for winter camping and winter travel in the Northern Forest. part two ! keyboard issues and age.. The Forest axe is still my tool of choice in my natural environment. Boggy , dank , deciduous woods ! I noticed the small carabiner/clip on the sheath of the three quarter axe. Is that to keep the mask safe whilst you use the axe ? I am always putting my mask down and mislaying it. Good idea ! I see the ‘Moomintrolls’ are still stalking you. I still mainly use the Small Forest Axe for general light woodland use in the UK. You’re right about the correct tool for the job feeling like an extension of yourself once you have learned to use it well. Great video on the importance of an Axe in the Northern Forest. I have a very good Pack axe for my Day hikes & it always stays in my pack. I will be purchasing a Small forest Axe soon for my longer trips, & for collecting firewood etc. Very important tool the axe is, If someone told me i could only carry 1 tool into the forest being an Axe or a very good Knife, Id pick the Axe hands down. A high quality swedish axe is capable of doing many tasks as you said in camp & collecting firewood, shelter making etc. I agree – an axe is the top tool when heading for the North Woods. And the higher the quality of steel, the better. Very intersting article. I really like video aswell as the written article very clear and well explained. As you know I love my small forest axe but after attending the elementary course last year its very rare i use it now. Good to hear from you. Thanks for your feedback – I’m glad you liked the combination of text and video. For me it’s always a good feeling to use an axe, so I understand about your love of the SFA. But it’s also great that you have extended your skills with knife and folding saw and able to do much more with them. Nice video, makes me want to chop something! 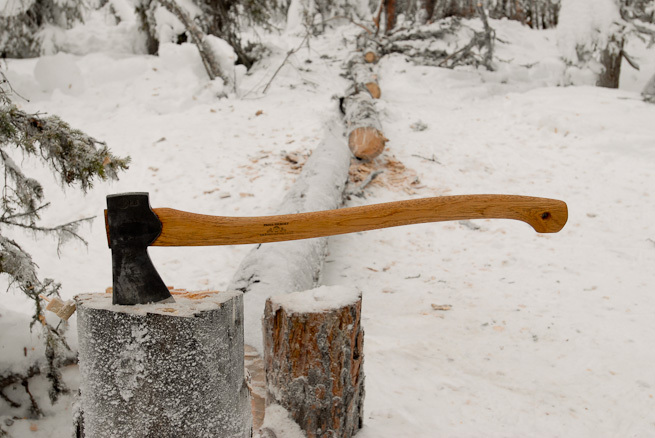 Have you heard of, or had problems with axes chipping when used in the extreme cold? I’ve read in old time outdoor books warnings to warm your axe before using in bitter cold to prevent chipping the blade. I personally haven’t, but was wondering if they warn of the same issue in Sweden? The GB Scandi Forest axe is great. I know that it is what Garrett Conover and Kevin Slater also use in the far north. These two veteran Maine Guides have a lot of experience with traditional winter camping and tripping. If I’m doing more of a base camp trip I’ll often bring a full sized splitting axe for doing the big work outside, as well one the size of the small forest axe for splitting kindling while seated or kneeling inside the tent. I’ve also read this in the old books but have had no trouble with these axes chipping in cold (down to minus 40 Celsius). Paul, good advice. My winter group has been going out for a February week long Maine camping trip for 6 years now. Each one of us carries the larger Forester Axe. We splitt a lot of spruce and birch to keep the stoves well fed. I also use it on my summer canoe trips. An incredible tool. I never leave home without it. It’s good to hear from a fellow winter camper and appreciator of a larger axe. Another great video, offering clear thoughts about the requirements of that particular environment. I have to admit that, while owning and trying out the SFA for a number of years, I never really liked it: the head was too light and the shaft too short. I now use, almost exclusively, a GB Wilderness Axe which gives me greater weight in the head and a longer handle yet still remains dextrous enough for the more delicate carving and feathering tasks. I can fully appreciate the benefits of something that is larger still for the Scandinavian Winter. I reckon I might well add such a tool to my Wish List… after all, Christmas IS coming and it’s just over a year until my birthday! Many thanks for yet more good, balanced and informed advice. It’s good to hear from you and thanks for your feedback on the video. I was interested to read your thoughts on the Small Forest Axe. I agree with your vision, but with the right techniques (working with wedges for example) you can still handle tasks quite well. There are some workarounds (perhaps for another video), but they take time and some experience. I totally agree with this after a trip to Norway at the begining of the year a larger axe was a must. I use a Swedish army axe as my choice, due to cost and it’s usefullness to me as well as it’s size which is extremely well suited to my size. Thanks for your comment. I’m glad the larger axe worked for you in a colder envionment. Another great read (furtively on my office computer). Hoping to get onto at least one of your intro courses this year, house moves and new job permitting. I would be very interested in an axe care/use woodcraft course as well if you consider running one. Great article. Just discovered your site and it’s great. My son is enjoying all your articles! I’m glad you’ve found me. Keep in touch! Nice video, a good axe is invaluable in the boreal forest – definitely in the winter, but I use one in the summertime as well. Let’s not forget the usefulness of a good saw however. At 03:31 I see you processing a fairly large tree, a task better suited for a good saw imo. Depending on the diameter of the wood, one could use a Silky Bigboy (14.2″ blade), a Bacho Laplander (9″ blade) or either a fixed bowsaw or the foldable alternatives such as Boreal21 (21″) or Bobs Quick Buck Saw (21″ or 24″). Many of these are very packable and light, though the bow saws may suffer from clearance issues. I guess what I’m saying is that a combination of tools is often useful. Yet another great article, choosing the right tool for the job is also choosing the safest tool for the job, where I am I have no need of an axe so seeing which axe is the best for a perticular situation is good info.